Home > Blog > Is Your Real Estate Agent or Broker Cheating You? While the horror stories you see all the time in the news about cheaters in the real estate and finance industry can be overwhelming, most professionals are honest and hardworking individuals. In many ways, the success of such professionals depends on honest hard work to generate referrals and high online ratings. That being said, the world of financial services is full of complex rules and confusing language that make it easier for professionals to cheat and harder for clients to detect. This article discusses some of the red flags of a broker or agent that may be failing to get the most out of your transaction. Before explaining some of these red flags, let’s take a look at a few different types of real estate professionals. What is the difference between an Arizona real estate broker, real estate agent, and realtor? A real estate broker is an individual who is licensed to negotiate and facilitate real estate transactions. Responsibilities of brokers include overseeing the work of other real estate agents, drafting contracts for buyers and sellers of homes, and arranging home buying and selling transactions. To become a broker under Arizona Law, an individual must complete at least 90 hours of approved “in classroom” Real Estate Broker pre-licensing education, pass the state broker examination, and demonstrate at least three years of actual experience as a licensed real estate agent within the past five years. A real estate agent, on the other hand, is a licensed salesperson who works under the direction of a broker. To become a licensed real estate agent under Arizona law, an individual must complete 90 hours of approved “in classroom” Real Estate Salesperson pre-licensing education, pass the state salesperson examination, and attend a six hour contract writing class. As you can see, the requirements to become a real estate agent are far less burdensome than the requirements to become a broker. A realtor is a broad term that refers to any broker, agent, or other real estate professional that belongs to the National Association of Realtors (“NAR”). Membership is contingent on paying dues and agreeing to follow the NAR ethical code. Is cheating by a real estate agent or broker necessarily deceitful? The short answer is, no—cheating is not necessarily deceitful. In fact, there is a good chance that being cheated is either a result of an inexperienced agent or bad contract drafting. 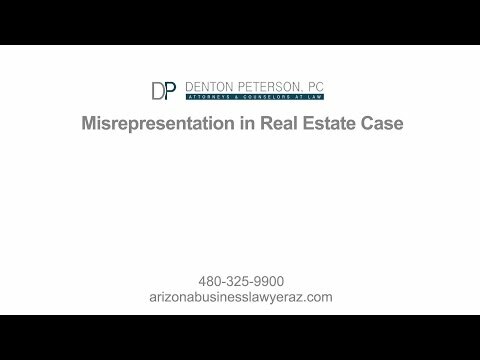 The reality is, brokers and agents are not usually as experienced as Arizona real estate attorneys and may not have the foresight to detect potential liabilities and other complex issues. When you hire an attorney, they are 100% committed to you and will act in your best interests because they are ethically and legally obligated to do so. On the other hand, brokers and agents are given incentives to close deals in certain ways and regularly have conflicting interests, which may prevent them from acting in your best interest. AZ Real Estate brokers and agents also frequently use standard forms to facilitate transactions. Such forms are often untailored, old, and poorly written. While good forms will contain standard elements (like those in the standard forms) based on Arizona state and federal law requirements, they will also be carefully drafted to further your best interests and protect you from unforeseen consequences. While standard contracts allow brokers and agents to crank through the signing process quickly and receive their commission, they also can severely damage you as a buyer, especially when the terms of the contract are complex. If your broker gave you standard forms to complete your complex transaction and the results were damaging, contact an experienced real estate attorney today to discuss your options in pursuing a claim against that broker or agent. While the broker may not have been deceitful or malicious in providing the quick and sloppy service, it does not mean that they should get away with it. How can I spot a cheater? Did your agent find you? How? Sometimes, agents or brokers find buyers and sellers in unorthodox and unethical ways. While using deceptive finding methods is not in itself cheating that directly harms you, it could be evidence that you are actually dealing with a cheater. If they are dishonest with you at the beginning, there is a good chance that they may be dishonest with you again. For example, sometimes agents make vague postings on craigslist or home search websites inviting interested individuals to call for more info. Once people call, the agent will tell them the property is no longer available, even though it was listed the very same day, but that they have several similar properties. Before you know it, the agent has you making an offer on a house. This is deceitful misrepresentation by the agent. If the agent is unethical in the way they found you, what makes you think they will be honest when negotiating terms and drafting contracts that are favorable to you? Does your agent also represent the seller of the home? This issue could look something like this: An agent has a lead on a great property and he convinces the seller to let him list it. Then, the agent will call all of his long-term clients who are looking to buy, including you, and will do his best to block out other potential buyers and buyers’ agents. Once the agent represents both the buyer and the seller, he can tailor each party’s contract to maximize his commission and collect from both the buyer and the seller. Does your agent push you to choose their own vendors? Real estate agents and brokers will sometimes suggest that their buyer use a particular mortgage loan broker, title company, or house inspector. Could they be cheating you? If they continue to push you to use only the vendors they recommend, then the agent is probably self-dealing by taking a referral fee from the vendor or he is involved in some other sketchy deal that you do not want to be a part of. If he continues to push the vendors on you, ask him what he gets out of it. This could be an opportunity to expose a cheater or even attempt to negotiate the agent’s commission based on his other interests. Does your agent consistently show you the wrong properties? If your agent is only showing you properties above your price range, or properties that do not fit your desired criteria, then your agent might be a cheater. Sure, this could just mean that your broker or agent is lousy at doing their job, but it could also indicate self-dealing. Sometimes, agents will filter the properties they are showing to clients based on high commissions and other personal incentives. You can avoid this conflict by personally researching properties that interest you and requesting that your agent show them to you. While the red flags above do not confirm a cheater, they should jump out to you and make you take a closer look at who you are working with. If you are unsure about your real estate agent, broker, or any other person involved with buying a property, then you should contact an experienced real estate attorney today. Your Arizona real estate attorney will be a key player in your property transaction and will make sure the decisions you make and the forms you sign are in your best interest. Additionally, an AZ attorney can advocate for you by negotiating strongly in your favor and helping you determine if your agent is actually working with your best interest in mind.